If you haven't already done so, please take a moment to renew your FAHCS membership now. The Florida Alliance of Home Care Services (FAHCS) gathered in Tallahassee with members of the association to meet with the Governor’s office, the AHCA Department and Legislative offices to discuss patient access issues, managed care concerns and simply educate leadership on the value of Durable Medical Equipment and the services that the industry provides. Additionally, joining the FAHCS will grant you access to the exclusive members-only area of our website that includes news and information about our future efforts. If you have any questions, feel free to contact us and a representative will be happy to discuss the benefits or pricing options in more detail. 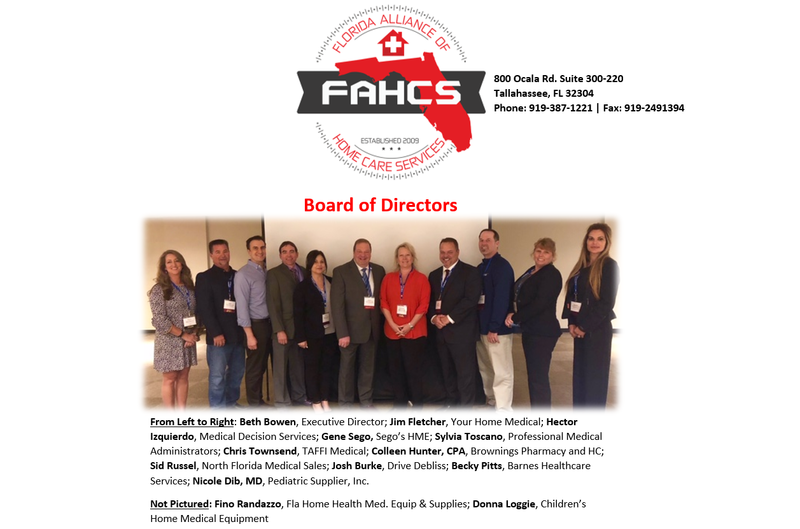 Our goal is to provide a forum for educational opportunities and advocating on behalf of the homecare community in order to improve the industry for patients and providers. We aim to provide a voice for those businesses to State and Federal entities that regulate the industry. Our accomplishments in previous years have been remarkable and we are looking ahead to even greater work for our Members in the future. We invite you to browse through our website, learn about our organization in our About Us page, learn more about the situation that the provider community is facing and consider joining the FAHCS by becoming a member of this progressive association. It's your business. Make sure your voice is being heard concerning federal and state regulations and policies. Use the following form to locate officials.